So, yeah. Paella is harder than I thought. My research lead me through dozens of different recipes. Some cook over an open fire. Some on the grill. Some with seafood. Some with chorizo. Some with eel or rabbit. And almost all requiring a paella pan. Uh oh. We are officially sans paella pan in the Flyover house. I should have been further concerned when I realized paella was not one of the 28,442 recipes in The Joy of Cooking. ie. Not an average home meal. 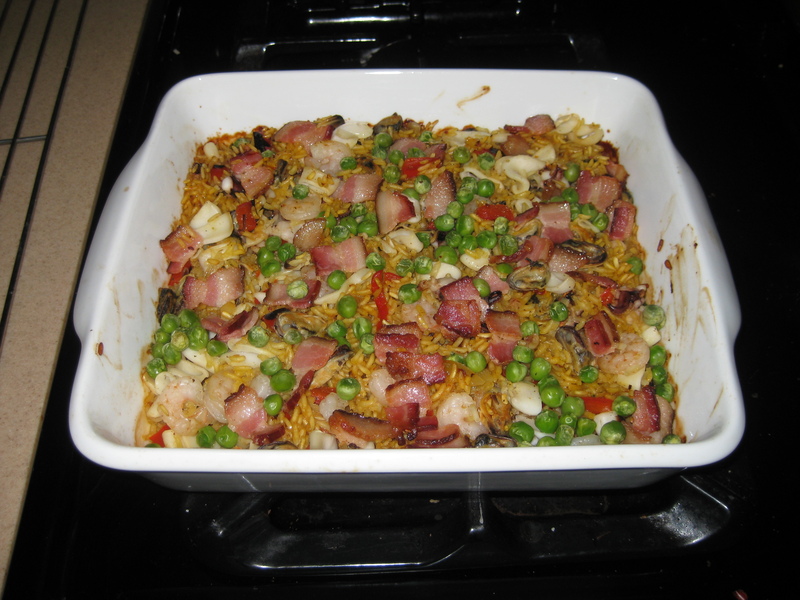 I did find one recipe for paella that used a baking method and had made an appearance in Bon Appetit magazine. Somewhat comforted, I made up my mind that this would be the best option with my lack of fire and pans. FANTASTICO! 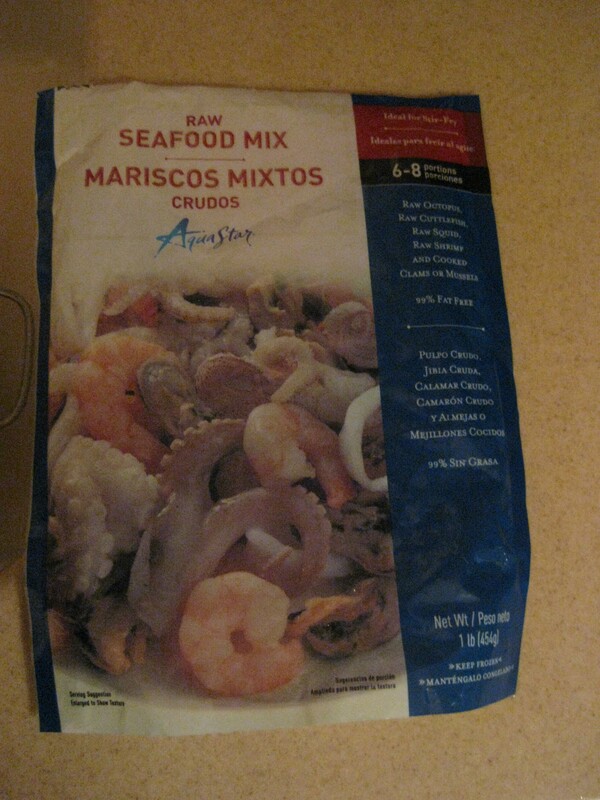 This would be my seafood mix for the recipe. I would still have to cut the recipe since I was making it for two, but this amount of mixed seafood would be almost perfect. Next I added the liquid and bring it to a simmer. This mixture gets poured into a baking dish. 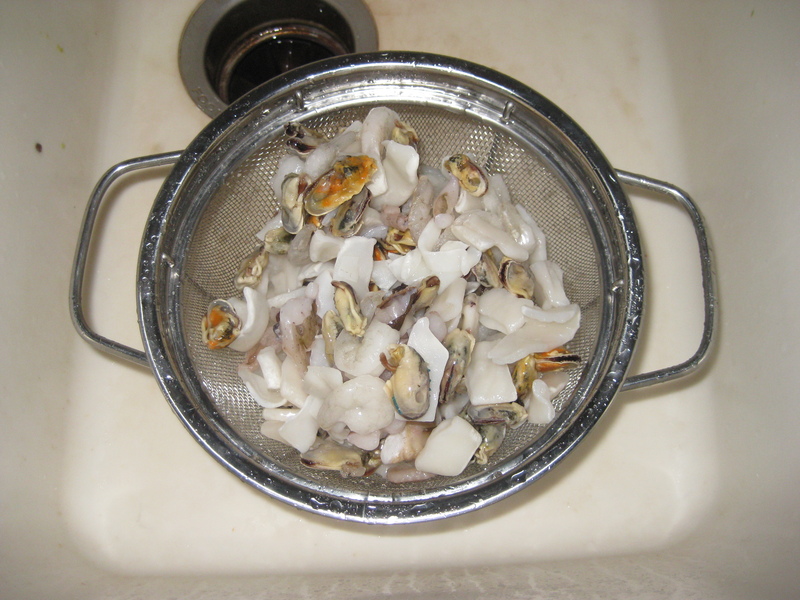 Rinse the seafood…..
Cuttlefish, shrimp, mussels, squid, and clams..........OH MY! 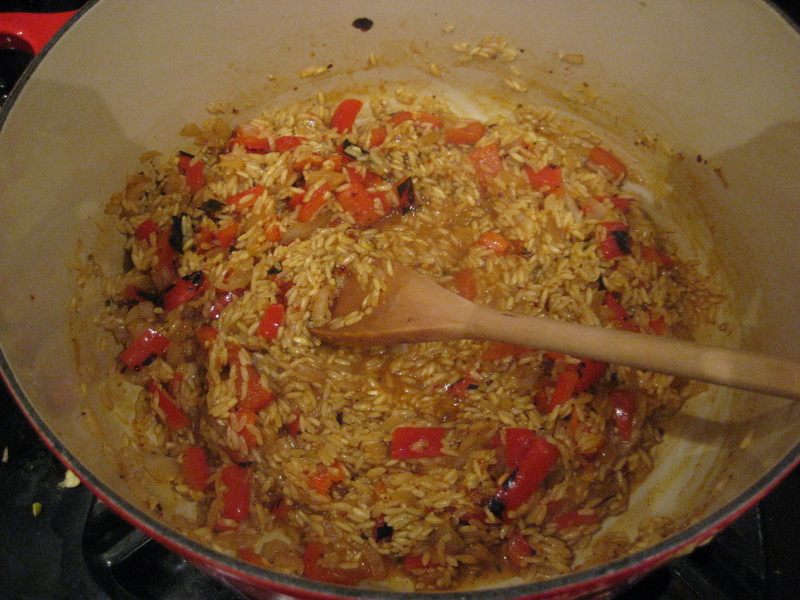 …and add to the rice mixture with the chicken. 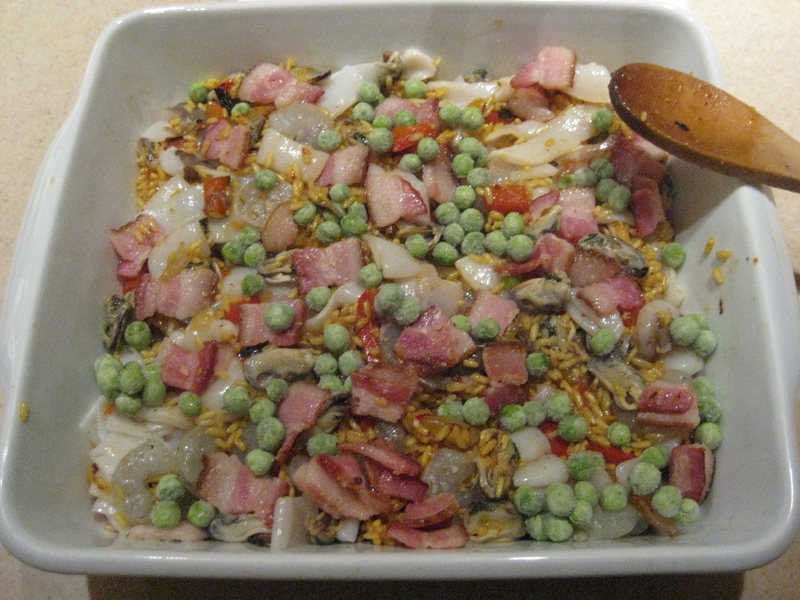 Finally, the peas and the bacon pieces get sprinkled on top. Cover the dish with foil and pop it into a 450° oven. The recipe uses clams and mussels in their shells and requires cooking for 45 minutes or until the shells open. Obviously, I was editing/reducing the recipe so I reduced the cooking time slightly so it wouldn’t be totally dry….maybe 30 minutes total. And…. It was still kind of dry. The reviews of the recipe on Epicurious noted that the seafood tended to get dried out and that the rice could get mushy. Check and check. Do I get sympathy points for plating? 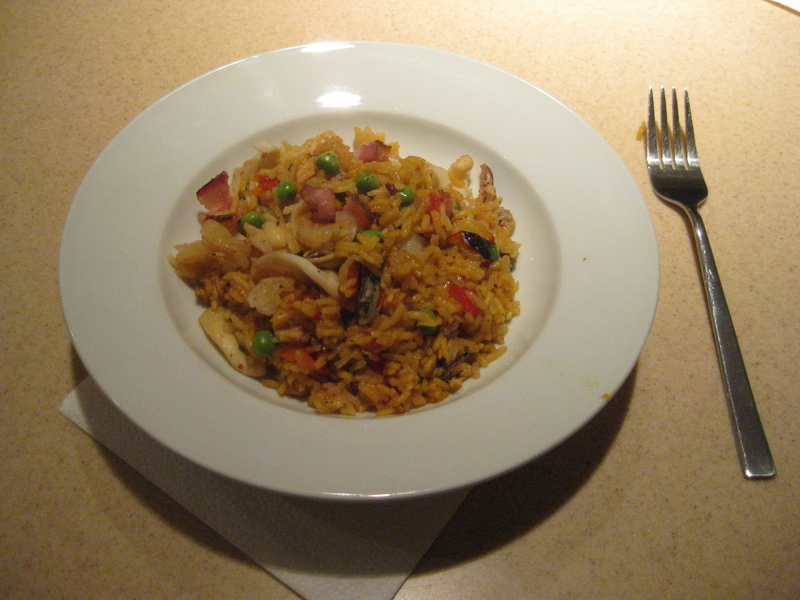 True Spanish paella should have a crusty bottom and seafood that retains its flavor and texture. It has a little bit of heat, but also the exotic warmth of the saffron and pimento. Notsomuch for my paella. UNFORESEEN BONUS: I learned two things. 1. Those marsicos mixtos would be great in a fun pasta dish. I fully plan on purchasing those little guys again. 2. Some dishes require special equipment to fully realize their potential. I have a feeling paella is one of those dishes. I hate to say it, but I think this was probably my least successful dish of the list. But I will not hold that against Spain. And hopefully, Spain will not hold it against me. p.s. Our FINAL 30 Before 30 post is coming up asap!! !